Identifying a dormant tree is not nearly as complicated as it might seem at first glance. 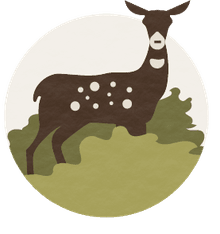 Dormant tree identification will demand some dedication to apply the necessary practice to improve the skill of identifying trees without leaves. I have compiled this gallery to augment your study of trees in winter to better identify tree species. Use this gallery and follow my instructions in A Beginning Guide to Winter Tree Identification. Using your powers of observation, you will find a pleasurable and beneficial way to enhance your skills as a naturalist - even in the dead of winter. Learning to identify a tree without leaves can immediately make your growing season trees easier to name. Vegetative structures on a tree are all important in its identification. The tree twig can tell you a lot about the kind of tree your are looking at. There is a bud on the tip of every twig where growth occurs. It is often larger than the lateral buds and some can be absent. Trees easily identified by their terminal buds are yellow poplar (mitten or duckbilled shaped), dogwood (clove-shaped flower bud) and oak (clustered bud ends). These are buds on each side of the branch. The trees easily identified by a lateral bud is beech (long, pointed scaled bud) and elm (buds off center over leaf scar). This is a scar of leaf attachment. When the leaf drops, a scar is left just under the bud and it can be unique. The trees easily identified by its leaf scars are hickory (3-lobed), ash (shield shaped)and dogwood (leaf scar encircles the twig). There are cork-filled pores on most trees that permit the living inner bark to breath. I use the narrow, long and light lenticels to partly identify just one species that can be tricky - black cherry. You can see scars within the leaf scar that are a big help in identification. These visible dots or lines are cork filled ends of tubes that supply the leaf with water. The trees easily identified by its bundle or vein scars are ash (continuous bundle scars), maple (three bundle scars), and oaks (numerous scattered bundle scars). This is the scar of a leaf-like attachment just off the leaf stem. Since all trees do not have stipules the presence or absence of stipule scars is often helpful in identifying a winter twig. The trees easily identified by its stipule scar is magnolia and yellow poplar. The pith is the soft inner core of the twig. The trees easily identified by its pith are black walnut and butternut (both with chambered pith) and hickory (tan, 5-sided pith). 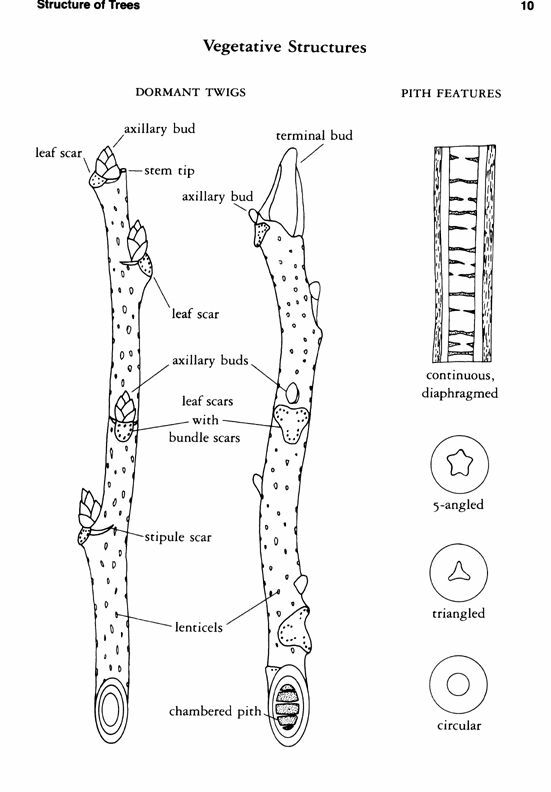 Opposite or Alternate Twigs: Most tree twig keys start with the arrangement of leaf, limb and buds. It is the primary first separation of the most common tree species. You can eliminate major blocks of trees just by observing its leaf and twig arrangement. The opposites are maple, ash, dogwood, paulownia buckeye and boxelder (which is really a maple). The alternates are oak, hickory, yellow poplar, birch, beech, elm, cherry, sweetgum and sycamore. Ash is a deciduous tree in North America, the twigs are opposite and mostly pinnately-compound. The seeds, known as keys are a type of fruit known as a samara. Long and narrow clustered winged seed. Continuous bundle scars inside leaf scar looks like "smiley face". The leaves are finely toothed. Flowers are small catkins produced in spring. The fruit is a small, sharply 3-angled nut in pairs and in soft-spined husks. Often confused with birch, hophornbeam and ironwood. Has long narrow scaled buds (vs. short scaled buds on birch). Has grey, smooth bark and often called the "initial tree". Often root suckers surround old trees. "Human-like" looking roots on older trees. The simple leaves are finely toothed. The fruit is a small samara. Birch differs from alder (Alnus) with a female catkin is not woody and will not fall apart. Often confused with beech, hophornbeam, alder and ironwood. Has short, scaled buds (vs.# long, scaled buds on beech). Male and female parts on same tree (male long catkins, female short cones). Yellow birch has wintergreen tasting twig. River birch has salmon colored exfoliating bark. Paper (canoe) birch has creamy white thin bark separating into papery strips. The leaves are simple with a serrated margin. The black fruit are somewhat astringent and bitter to eat. Has narrow corky and light, horizontal lenticels on young bark. Bark breaks into dark plates and raised edges on older wood described as "burnt cornflakes". Twig has "bitter almond" taste. Bark is dark gey but both smooth and scaly with reddish-brown inner bark. Young cherry has narrow corky and light, horizontal lenticels on young bark. These flowering dogwood buds will burst into white flowers in Spring. Flowering dogwood trunks are noteed for "Square plated" bark. Slender twig, green or purple early turning gray later. The terminal flower buds are clove-shaped and vegetative buds resemble a dull cat claw. Here is rock elm with a yellow-tinted, plated bark. Has brown irregular bark that is tinged with red. Bark acts like cork when pressed with finger nail (bounces back). Bundle scars in three clusters. Here is American elm with irregular bark with a slight yellow tint. Hackberry bark is smooth and gray-brown when young, soon developing corky, individual "warts". This bark structure is a very good identification marker. Pith is often chambered at the nodes..
Corky and warty bark, later turning to corky ridges. Round dried drupes (seed) may be found under tree. Hickories are deciduous trees with pinnately compound leaves and large with hickory nuts. Remnants of these leaves and nuts will be found in dormancy. Variable bark not helpful except for loose, flaky shagbark hickory. Nuts and husks under tree. Stout twigs with large terminal bud. Large heart-shaped to 3-lobed leaf scar. Pecan is a member of the hickory family. It produces a very popular nut produced in commercial orchards. Magnolia bark is typically brown to gray, thin, smooth/lenticellate when young. Close plates or scales appear as it ages. Stout twig with white to rusty matted hairs on leaf bottom. Leaf is Alternate, simple, evergreen, oval and relatively large. Silky white to rusty red terminal bud. Maples are distinguished by opposite leaf and twig arrangement. The distinctive fruit are called samaras or "maple keys". Red buds and new red stems on red maple. Bark is generally gray but variable in form. Terminal bud is is egg-shaped and slightly larger than lateral buds. Silver maple bark is light gray and smooth when young, but breaks up into long thin strips, loose at ends when older. On young red maple trees you see smooth and light gray. With age bark becomes darker and breaks up into long, fine scaly plates. Red maple has beautiful red seed, sometimes called a key. Many oaks including water oak have variable bark forms and sometimes not helpful for identification alone. Variable bark not very helpful. Clustered buds at tip of twig. Persistent leaves on live and water oak. Slightly raised, semi-circular leaf scars. Acorns persistent on twigs or under the tree. All oaks have acorns. The nutty acorn fruit can persist on limbs, can be found under the tree and is an excellent identifier. Certain oaks, including water oak and live oak, are persistent to semi-evergreen. Persimmon bark is deeply furrowed into small square scaly plates. Small square scaly plated bark. Fleshy rounded fruit may be found under the tree. Twigs are slightly zig-zag and often hairy. Smooth dark gray/brown bark furrowing with age. Flat and long narrow pods under tree. Twigs are brown, slender and angled. Sweetgum bark is gray-brown with irregular furrows and rough rounded ridges. Note the water sprout on the bole in the photo. Corky outgrowth on twig bark. Spiny "gumballs" on long stalk. Sweetgum leaves are palmately lobed with a long and broad petiole or stem. The compound fruit, commonly called a "gumball" or "birball", is a spikey ball. Mottled "camouflage" exfoliating (peeling) bark (green, white, tan). Spherical multiple achenes with long stalks (fruit balls). leaf scar nearly surrounds the bud. Buds are large and cone-shaped. Yellow poplar bark is an easy identification marker. Look at the gray-green bark with unique "inverted V" on limb to trunk connections. "Duck bill" or "mitten" looking buds. Large stipule scars encircling the twig. Unique "inverted V" on limb to trunk connection. Gray-green bark with light furrows. Pith often divided by partitions of stone cells. Yellow poplar has a very interesting twig. Look at the "duck bill" or "mitten" shaped buds.